The Reflection of Excellence Award is given annually (since 1981) in the Utah National Parks Council for outstanding service to Cub Scouting in the Council. It may be given to a woman, a man or a husband-wife couple. The award is given in memory of RELVA JOHNSON McGARRY who was a dedicated and talented leader in Cub Scouting. The medal is designed so that the recipient looking at it will see his or her reflection, thus reflecting the person’s accomplishments in years of service to Cub Scouting. Relva McGarry worked in Cub Scouting for 24 years. 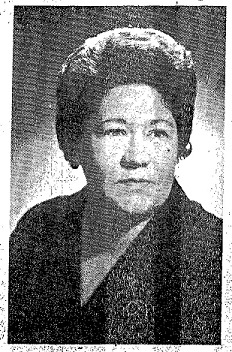 She was the wife of Barney McGarry, a former Council Vice President over Cub Scouting. She had many talents and occupied many Cub Scout positions at the unit, district and council levels. With her husband she advised the General LDS Primary Board on Cub Scouting matters. She developed leaders; she was an organizing perfectionist; she had contagious enthusiasm; she always kept the goals of Cub Scouting in mind, and always emphasized what is right for the individual boy. Relva received many awards and recognitions for her service. Click here for List of Past Recipients.